Chandigarh : Colors are the smile of the nature and nature always wear the colors of spirit. The same was visible at Teej celebrations at DAV College, Sector 10, Chandigarh which were organized to celebrate the bounty of nature, arrival of clouds and rain, greenery and birds with social activity, rituals and customs. Dr B.C Josan, Principal, DAV College, Chandigarh inaugurated the event by offerings of flowers and fruits to the goddess Parwati and prayed her to bestow utmost grace and knowledge to students. Dr. Josan enlightened that the nation’s culture reside in the hearts and souls of its people. Culture makes people from diverse backgrounds understand each other better, and if they understand each other better, it becomes easier to overcome all burdens and barrier. To add vigor to the day’s celebrations, swings were set up under trees and open courtyards. 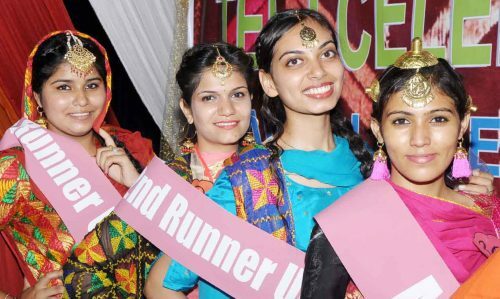 Girls dressed in green clothes sang songs in celebration of the advent of the monsoon while Mahendi, Bangles, Nail Art designing and Miss Teej competition was also organized to make the event more lustrous. The chief guest of the event, Mrs Gandhar, crowned Ms Simranjeet Kaur as Ms Teej, Ramanpreet kaur – 1st Runner up. In mehndi, Pratibha and Monika bagged first and second positions. Jaspreet kaur and monika were declared 1st and 2nd positions in “Ghara Chukna”. She enlightened the youth about our glorious culture and heritage. The celebrations concluded with energetic and adrenalin pumping Gidha and Bhangra performances from the students of the college. सर्वप्रथम किसने बांधी राखी किस को और क्यों ?